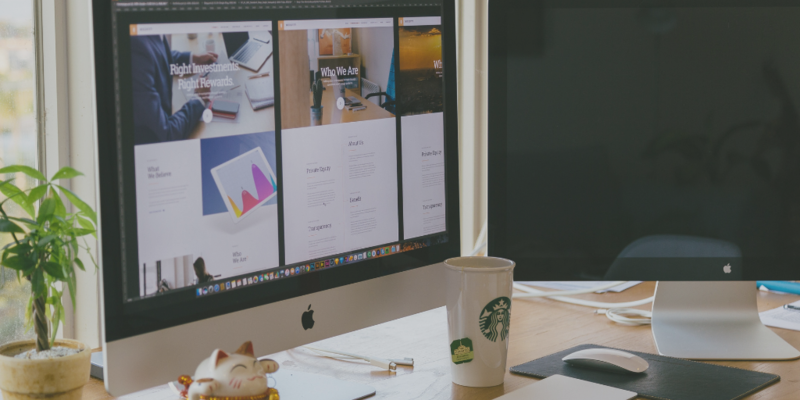 With website design and development constantly changing, keeping your business’ website ahead of the competition (and subsequently ensuring its able to attract and retain visitors) is an ongoing process. A static, one-page brochure type website, especially in B2B, will inhibit your ability to engage with website visitors and generate high-quality leads. 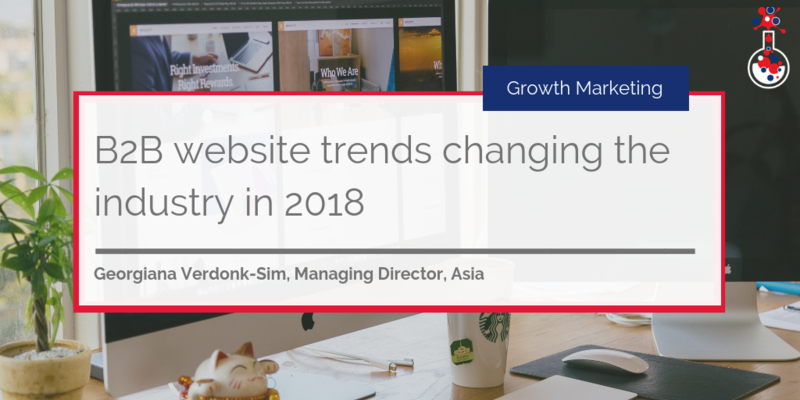 So to give you a better idea of what you could be doing to enhance your website and enable it to generate more qualified leads, we took a look at the top B2B website trends in 2018, as well as the top B2B websites, and identified the similarities they have. Banner CTAs are a hallmark B2B website trend in 2018. HubSpot, Databox, Hootsuite, Intel, IBM and even DHL are just a few of the top B2B websites utilising banner CTAs (and to tremendous effect). Some of these websites have a scrolling banner CTA which shows website visitors more than one service offering. Banner CTAs give website visitors the opportunity to find out more about the product or service on offer right away and blend seamlessly into the rest of the web page, so they don’t interrupt the user experience. As they are large and prominent, they can’t be missed – so website visitors can always scroll back up to the top of the page should they want to find out more. Chatbots are another B2B website trend. Consumers have queries but sometimes businesses aren’t in a position to answer them. This isn’t because they don’t have the answers – they do – it’s because they don’t have the capacity to respond. Some businesses – start-ups and SMEs in particular – just don’t have the resource. They have a small marketing and sales team and just don’t have enough time in the day to respond to all enquiries. However, what they do have is the content that answers consumers’ questions. So instead of spending hours responding to queries via email, one way businesses corresponding with consumers is via chatbots. Chatbots have reached a point of sophistication where they are able to analyse a website visitor’s behaviour, the pages they have viewed and their contact record stored in the CRM to give accurate answers to potential questions or direct them to the right pages. So instead of a customer service representative sitting on live chat all day, chatbots are being used by B2B websites instead to answer some of the more basic questions website visitors have, whilst customer service representatives instead converse with website visitors who are further into the buyer’s journey. Using this process, these businesses are able to scale their engagement activity despite having limited resource and direct website visitors to the most informative content. Unlike pop-ups that are intrusive and interrupt the user experience, slide-in CTAs usually appear after a website visitor has been on a web page for a certain period of time or arrived at a certain point on the web page. For example, slide-in CTAs can be configured to appear after x seconds have elapsed or a website visitor has scrolled to the bottom of the page. This way, the CTA doesn’t interrupt the website visitor. You could easily include a slide-in CTA on a blog, for instance, and that CTA could be linked to another relevant and interesting article. Using slide-in CTAs you can increase your website’s conversion rate and target website visitors who would have otherwise read your content and left. Want to find out more about placing CTAs on your website? Check out this blog. The days of ‘above the fold’ are over and deep scrolling websites have quickly become the norm. Web design in general has moved away from short pages and embraced the fact that deep scrolling pages are simply more effective. Think about how most people view websites today. More and more of us are using our mobile (and there’s no option for anything other than scrolling). Not surprising when you realise that mobile search exceeds that of desktop search. Deep scrolling will continue to be a standard in modern website design – and even more so as mobile devices become larger and more powerful. As time goes on, it won’t just be a B2B website trend but a website essential. Find out about the latest and most successful marketing trends across Europe and the US with this free webinar. Websites are becoming more minimalistic – more sleek. Websites today put greater focus on empty space, large bold fonts and bright (but not overstated) colours to attract attention to specific areas. Text is generally very short and concise; business websites are moving toward a point where products and/or services offered are encapsulated in just a few words as website visitors may not necessarily have much time. Take Asana’s website, for example. Whilst it’s not heavy on bright colours – it does have a very simple yet sleek design. All of the elements are carefully segmented, the text is crisp and large and it makes good use of animated and interactive elements to keep website visitors engaged. The website's messaging is also straightforward and the product is described in just a few words. Remember we mentioned that mobile search exceeds that of desktop search? That’s exactly why mobile optimisation is important and will continue to be in the years to come. Most websites are optimised for mobile devices. Just resize your browser to half-screen size and that’s essentially what you’ll see if you were to view that web page on a mobile. If your website is not optimised for mobile, you are missing out on a good chunk of website traffic and potential leads. These are the top B2B website trends in 2018. Some of them will remain relevant next year and even the year after (deep scrolling websites won’t be going anywhere any time soon) so it’s important that you incorporate these elements into your website or at least consider them if you want to improve the user experience on your website and generate more leads. If you want help building or even optimising your website for lead generation, why not check out our free eBook: 10 Things to do to make your website generate sales leads by clicking the button below.